A game live on BT sports, but we decided to watch the game in the Frog and Parrot in the high street. 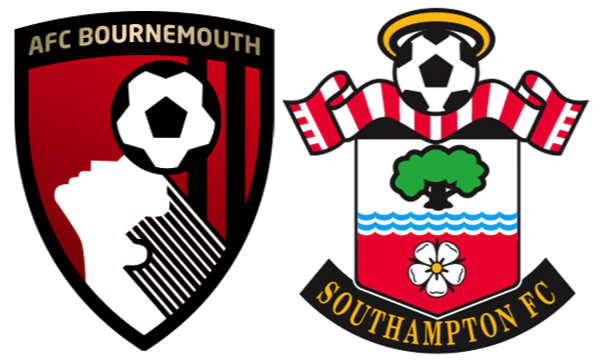 A lot of discussion before the game on if this was a genuine local rivalry, maybe this is because it's only the 9th time that Saints and Bournemouth have been in the same league, in fact you have to go back nearly 60 years since Bournemouth won a league game against Saints. Bournemouth came into the game on the back of 3 straight home defeats desperately looking at the bottom of the table, where as Saints were looking to make a top 6 finish. The game started at a frantic pace and on their tiny pitch Bournemouth looked the more lively of the two sides. In the very first minute Forster had to make a very good save at his near post. Bournemouth were closing down Saints at every opportunity. As a result, Saints struggled to get going, seeming unable to gain any momentum. There was no rhythm to the game at all, the referee blowing for a free kick every time a player went to ground, Bournemouth seemed to play on this. On 30 minutes, a long ball went straight to Fonte. Rather than play the ball, he seemed determined to let the ball go for a throw in (what the hell were you thinking José ?! ), but the ball was not traveling fast and King did well to whip in and nick the ball from him. In chasing King back, Fonte made minimal (if any) contact with King and the ref gave a free kick. Richie from quite a tight angle shot to the near post. Forster was not expecting the shot and did well to make the save, but only pushed the ball out. Van Dijk was ball watching and let Cook have the space to put the ball in the net. Bournemouth continued to give Saints no time on the ball and the visitors seemed to have no outlet. The home side were out-battling Saints all over the pitch and it was no real surprise when Koeman decided to change things on 35 minutes. Whatever the original game plan was, it certainly wasn't working and Steven Davis came on for Yoshida. There was still no improvement in Saints play and Bournemouth were by far the better side. They seemed to have a ridiculous amount of corners, but strangely Forster didn't really have a lot to. Just before half time a strange incident by the players tunnel saw the 4th official fall to the ground. There seemed some confusion as to what whatever happened, but the ref decided to call half time a minute or so early. Saints had been shell shocked by how little time they had on the ball, they don't like being pressed and Eddie Howe had certainly done his homework, surely Saints could only get better? The second half started with no real change, Saints never really got in the game, creating nothing. On 60 mins Austin, who was very anonymous on the night, went off injured, (it looks like he could be out for a while), Pellè came on and for a while Saints actually improved. Ten minutes later Long got injured and limped off for Tadic to come on. For a brief period it felt like Saints would get at least an equaliser, but those thoughts ended on 80 minutes. Bournemouth were given a free kick, Ritchie played the ball into the area and once again Van Dijk was the wrong side of the attacker. Forster hesitated, and Afobe made it 2-0 to Bournemouth with a header. Probably one of the worst performances I think I have seen for Saints, they were second best throughout the game, a game which Saints should forget and quickly move on.